Happy Early Week Greetings to You! It has been a few weeks since we have shared together… hopefully you have been keeping up with our SoccerPlex Stadium renovation via the picture summary and videos. 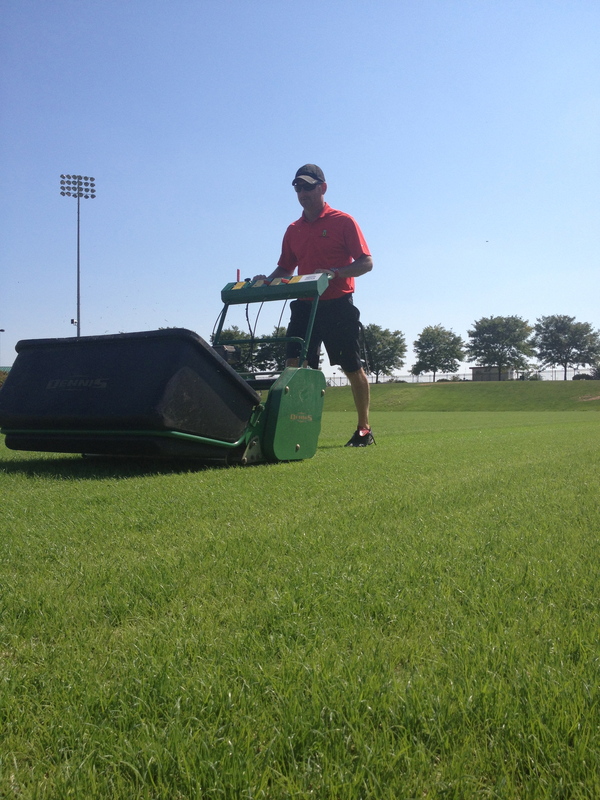 This past Friday was a big day- the 1st mowing of the field took place 20 days after seeding Kentucky bluegrass. I continue to get numerous questions about the reasons for the renovation, the renovation process itself, the reason for deciding to seed vs. sod, and especially in regard to the grow-in process that is being used to establish the field so quickly. During the next few posts we will discuss the merits of each part… the thinking, the decision making, and the lessons. Hopefully there are things that will be helpful to you and your maintenance plan immediately! Additionally, we have been working through a renovation process on 9 of our cool season native soil tournament fields. We will also discuss the new and aggressive methods we are using to increase playability and decrease rain-outs on heavy native soil. Stay tuned during the next few days for the opportunity to share and discuss these topics. I am looking forward to it! In the mean time, cheers to a successful week! !